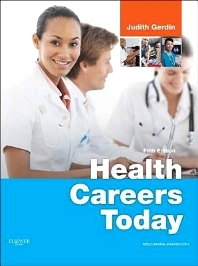 Describing more than 45 health careers, Health Careers Today, 5th Edition offers a practical overview to help you make an informed decision in choosing a profession. Not only does it discuss the roles and responsibilities of various occupations, it provides a solid foundation in the skills needed for all health careers. Clear explanations of anatomy and physiology provide essential knowledge of health related to the human body, and show how this applies to different careers. A companion Evolve website includes skills videos, animations, quizzes, and flashcards. Written by experienced educator Judith Gerdin, this book reflects National Health Care Skills Standards.